You'll love Grandma's easy banana bread recipes. There's nothing more delicious than the taste of old fashioned banana bread. Especially when you eat it fresh from the oven, its slices spread with rich-tasting creamery butter. Mom always called it banana loaf, but its name isn't important. Yes, there are variations, but it's the moistness and banana flavor that makes this dessert bread unique. It's often served as an alternative to cake. 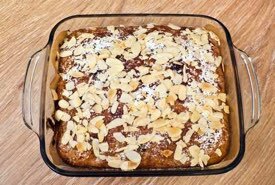 Ingredients: 1-3/4 cups sifted all-purpose flour, 2-1/4 teaspoons double-action baking powder, 1/2 teaspoon salt, 1/2 cup chopped nuts, 1/3 cup shortening, 2/3 cup sugar, 2 slightly beaten eggs, 1 cup mashed bananas (3 to 4 fully ripe bananas — yellow peel flecked with brown), 1 cup mixed candied fruits and peels, 1/4 cup raisins. Method: Sift together flour, baking powder, and salt. Add nuts and blend. Beat shortening until creamy — 300 strokes. Gradually add sugar, beating until fluffy after each addition. 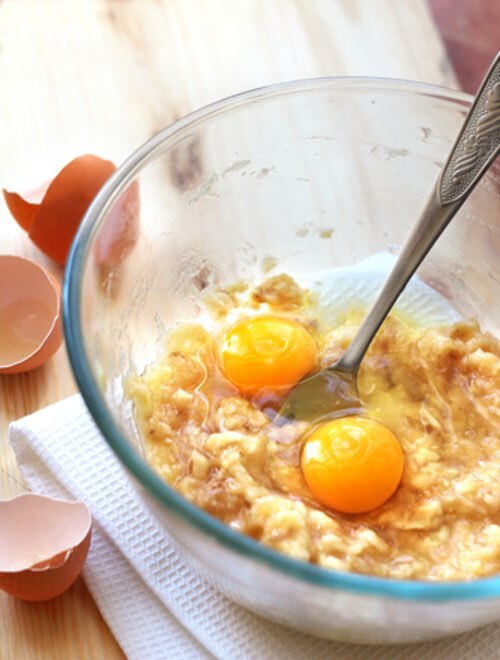 Add eggs and beat until thick. Add flour mixture and bananas alternately, blending thoroughly after each addition. Fold in fruits and raisins. Grease bottom only (not sides) of 4-1/2 x 8-1/2 x 3 inch loaf pan. Turn batter into pan. Bake in a moderate oven (350°F) 60 to 70 minutes. 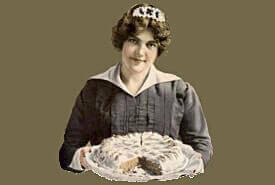 Mom often made these moist dessert loafs when she knew company was coming or to take on family outings. They were always delicious, especially when sliced and spread with butter and either homemade jam or jelly. 2-1/2 cups flour, 3 teaspoons baking powder, 3/4 teaspoon baking soda, 3/4 teaspoon salt, 6 tablespoons oil or shortening, 3/4 cup sugar, 2 eggs, 2 cups mashed bananas (4 bananas), 1-1/2 cups whole bran cereal, 1-1/2 teaspoons vanilla, 3/4 cup chopped nuts. Sift flour, baking powder, baking soda, and salt together. Cream shortening and sugar; add eggs, and beat well. Stir in banana, bran cereal, and vanilla. Add dry ingredients and nuts. Mix only till combined. Bake 50 to 60 minutes at 300°F in greased and floured 9-cup mold or pan. 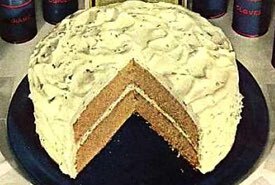 1-1/3 cups flour, 2 teaspoon baking powder, 1/2 teaspoon salt, 1/2 cup walnut meats, 1/3 cup shortening, 2/3 cup white sugar, 2 eggs, 3 cups mashed bananas. Bake about 1 hour in 300°F oven. Combine and mix the ingredients as for banana nut bread (above). 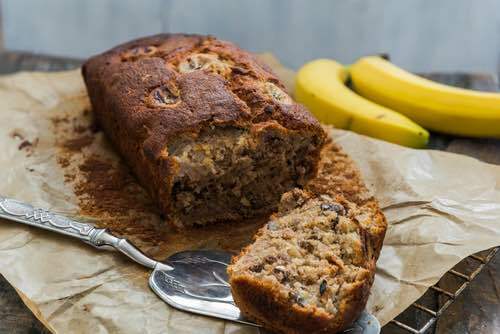 Banana breads and cakes came into popularity during the early 1930s when enterprising grocers often provided their customers with free banana recipes in an attempt to sell overstocked or overripe bananas. Banana bread (or loaf) makes a nicely comforting treat to eat with a cup of tea or coffee. It's perfect for serving on any occasion, and it also makes a most-welcome, homemade gift for someone special. And these are the nicest banana breads you'll ever find. Our family has enjoyed them for generations. Slices of homemade banana bread are delicious to eat with jam. Or, they can be buttered or simply left plain. Myself, I love them "generously" buttered. So indulge yourself. Try Grandma's old time, easy banana bread recipes and experience the taste of something truly special.